The last year has been very active for Google Ads – from rebranding, new interface and several new campaign types launched to small updates which keep happening as we speak. YouTube has been one of the areas with biggest development. A recent report from Cisco stated that by 2020 81% of internet traffic will be video. This is the reason why advertising on YouTube is going to become much more adopted than it is now. 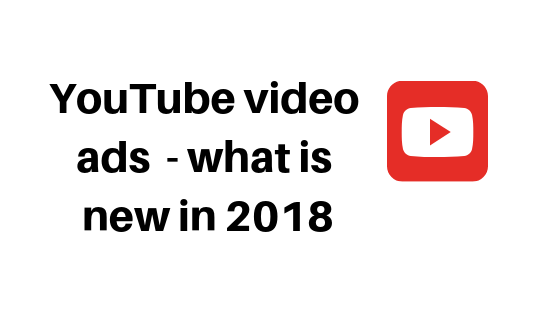 Google keeps launching new features which make the creation of YouTube campaigns easier and providing more control to advertisers. What you need to know before starting to advertise? Your video ad must be uploaded on YouTube as a publicly listed video in the account which you have linked to your Google Ads account. The only conversions you will see on Google Ads from YouTube are the ones where the last interaction was with the YouTube ad. If there was another action on Google paid search or display in between, they will get the credit. Also if someone saw the video ad, did not interact, but then converted on your website will only be visible as a view -through conversion. To see these conversions, you have to add an extra column to your report, as they will not be automatically included in the “Conversions” column. In YouTube a view is when someone watches a video ad for more than 30 seconds or interacts with the ad before that. An impression means that they did not watch the ad, but were exposed to it. One of the main criticisms against YouTube advertising was that it is not directly showing results in conversions – it is difficult to measure and attribute results directly to the platform. To tackle this, Google launched YouTube for action – video campaign type meant for advertising with a conversion goal in mind. What does this mean? If your goal is generating leads for your website, for example, you can now create a video campaign with a button to click directly to your website. But the button is not the only difference – these campaigns can be run with automated bidding – Target CPA or Target ROAS. YouTube for Action was meant to run with an automated bidding campaign as it would fully focus on generating as many conversions as possible. Google improved significantly their Similar, Affinity and In-Market Segment audiences by including signals from all their platforms – Google Play, Google Maps, YouTube and Search. On top of this they launched two new audiences – Life Events and Consumer Patterns. Life events are related to significant moments in people’s lives – new home, graduation, new business, marriage. These are very useful for advertisers selling a specific type of product like wedding dresses or graduation gowns. Consumer patterns are a bit broader audiences. They are composed on buying signals from users’ online behaviour. This allows advertisers to target frequent shoppers, restaurant goers and other pools of users with predictable shopping behaviour and interests. Keyword targeting on YouTube is on of the biggest benefits of the channel. Keywords on display are now replaced by Custom Affinity and Custom Intent audiences, in which advertisers can create their own combo of urls and keywords. On YouTube keywords still stay, but they are different from the display keywords. Advertisers on YouTube can target users based directly on what they typed in Google Search. Imagine all the people who are trying to find something on Google, but do not click on ads? 82% of them also use YouTube, so this is a great way to reach them back. A new feature from Google is the Sequence campaign. It allows advertisers to create a series of ads – a combination of different formats and lengths to lead a user through a real journey. You can’t target with keywords, topics, or placements, but you can exclude keywords, topics, or placements at the campaign level. For a user to move to the next sequence step, they must have at least one impression from the previous one. This feature allows you to tell a progressing story with your video ads and move the user through different stages of the funnel. What is great is that you can be different and not oversaturate with one video ad type being shown to the same person too many times. Frequency capping for sequences limits the amount of times people will see your sequences to 1 sequence per person in a 30 day period. This means that more people will be exposed to your ad and they will see it less frequently once they have gone through the sequence. Sequence campaigns can only run with Target CPM, Maximum CPM, Maximum CPV and Target Viewable impression bidding strategies. In general they are a great way to introduce people to a new product, tell a story and keep them interested without being too often in front of them.